Promoting Holland to celebrate Prinsjesdag, which is today. Artist Reply: Thank you very much, Ron. Artist Reply: Thanks a lot, Al! Artist Reply: Many thanks, Maria! Artist Reply: Thanks a lot for the great comment, Vernonette! Artist Reply: Thank you very much, Jimmy! Wonderful seascape! The shapes of the boats and the details are perfect. Great talent! Congratulations Anneke. Artist Reply: Thank you for all the sweet words, Angel! SPLENDID COMPOSITION ANNEKE. MARVELOUS WORK. Artist Reply: Thank you for your always beautiful comment, Pamela! Artist Reply: Thank you very much, Anna Marie! Artist Reply: Thank you so much, Bruce! I love it, Anneke!! What a beautiful painting!! Artist Reply: Thank you very much, Heloisa! Anneke Hut - das ist sooo gut! Anneke -versteck das nicht in der Ecke :) Charming, und ----- es bewegt sich! What a wonderful painting Anneke! Exceptionally beautiful painting ! I love the textures in your brush strokes ! Great work ! Artist Reply: Thank you very much, Sigga! This is superb work!!!!!!!!!! Gorgeous!!!!!!!!!! Artist Reply: Thank you very much, Elizabeth! High praise for this Anneke! Artist Reply: Thanks a lot, Calvin! This is stunning...I love it! This is so beautiful. Serenity at it's best!! Wonderful.! Artist Reply: Thank you very much, LouAnn! Overwhelming beautiful Harbor and Excellently captured. Warm tones are great. This scene was made for My POD! as Well :-) Happy Celebrations! Artist Reply: Thank you so much for the beautiful comment, John! Anneka! 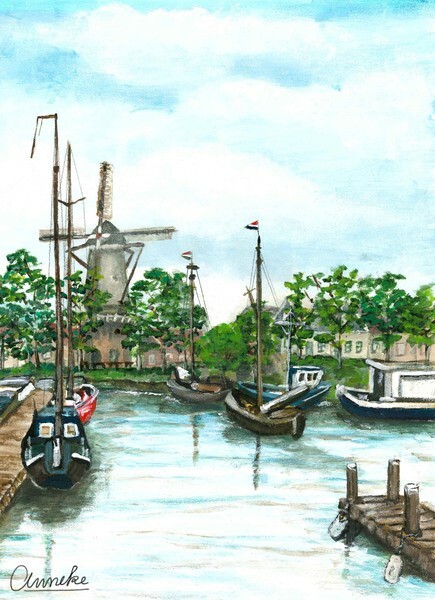 what a peaceful and lovely everthing Dutch theme so masterfully composed! I have visited Holland and loved it!! Hedy!! Artist Reply: Thank you very much, Hedy! This painting, like all of your paintings, gives such a pleasant feeling. So beautiful! Artist Reply: Lillian, what a sweet thing to say! Thank you very much!! Artist Reply: Thank you very much, Steve! Artist Reply: Thank you so much, Joanie!! This is lovely Anneke,great perspective! Artist Reply: Thank you so much for the warm comment, Yves! lovely painting! a real Anneke work, love it! Lovely and wonderful painting Anneke. A VISUAL delight! beautiful anneke. what a lovely scene! What a peaceful beautiful place. Beautifully captured! Artist Reply: Thank you very much, Bev! Love the nautical theme Anneke!!!!! This is a wonderful composition you must be painting on site. Artist Reply: Many thanks, Stanley! Artist Reply: Thank you very much, Jo! beautiful watercolor of a lovely scene! Artist Reply: Hi Dee, thanks so much for the visit and the sweet words! DELIGHTFUl scene, Anneke!!! Thank you for sharing and Happy Prince Day!!!! Absolutely wonderful work and such a typical sight for your lovely country, dear Anneke! Artist Reply: Thank you so much, Trixi! Splendid work, looks like such a wonderful place to be, makes me wish I were there! Artist Reply: Many thanks, Kate! Absolutely beautiful scene Anneke, you live in such a exciting place! Artist Reply: Thank you very much, Ropati!